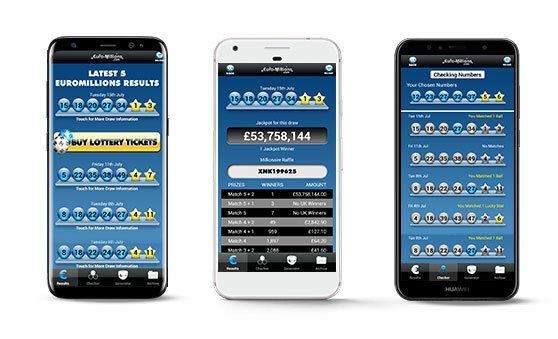 The free EuroMillions Android app allows you to get the latest results, check your numbers, browse past results and pick your numbers for the next draw. EuroMillions results are updated within seconds of each draw so you can stay up to date wherever you are in the world. The EuroMillions App is compatible with most Android devices running Android 2.3.3 Gingerbread and above. 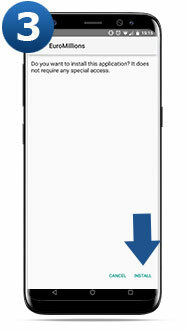 Click the file to install the app on your device. Depending on the configuration of your device, you may receive a notification that you can only install apps from the Android Market. 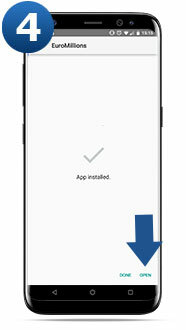 As this app is provided directly from our website, you can still download it to your phone simply by clicking the 'Settings' button, ticking to allow the installation of non-Android Market applications and then clicking to download the file again. You will be asked to confirm installation of the app and then a notification that internet access is required to communicate with our online lottery server. Click the 'Install' button to accept. Once the installation process is complete, open the app to start enjoying the features!